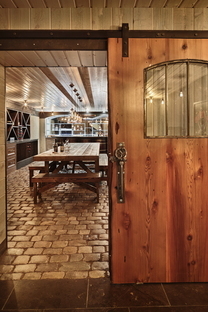 As we know, “Good things come to those who wait” and here it is actually the architectural manifesto of the project for Manson Barn, a farm property in central Washington state. Seattle-based studio SkB Architects was appointed to revamp an old barn on a 48,000 square metre property offering views of Dry Lake and the Cascade Mountain Range, a real rural paradise. When work began, the architects and clients hit it off so well that they worked closely together to expand the project, turning it into a holiday retreat and entertainment and events facility without neglecting the aspects associated with farm work in its strictest sense. Over a four-year period, and using the old barn and clients' sketches as the basis, SkB Architects came up with a building that balances a desire for renewal and extension with the vernacular language that at no time falls into the clichéd reiteration of historical elements. 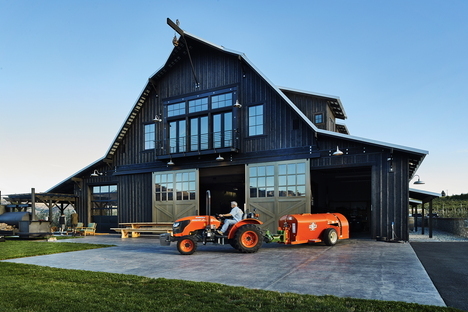 The 929-square-metre barn features a large, open ground floor area for entertainment and events, a commercial kitchen complete with pizza oven and storage for farm equipment. A wine cellar has been located in the basement, and bedrooms and living area are situated on the second floor, right below the hybrid roof form based on a traditional Dutch barn roof with the additions of dormers and gull wings. This enabled SkB Architects to extend the interior space upwards without encroaching too far onto the land. Local materials like black-stained wood siding, together with renewable resources for heating underscore the sustainability of Manson Barn far beyond just the visual respect of the architectural design, towards the landscape of Chelan County.